Scott Legato/GettyMiguel McKelvey (L) and Adam Neumann speak during the WeWork Celebrates The Detroit Creator Awards at Cadillac Square on May 25, 2017 in Detroit, Michigan. WeWork is raising $US1 billion in debt from its existing investor SoftBank. It’s already raised billions of dollars in equity, including $US4.4 billion from SoftBank alone. 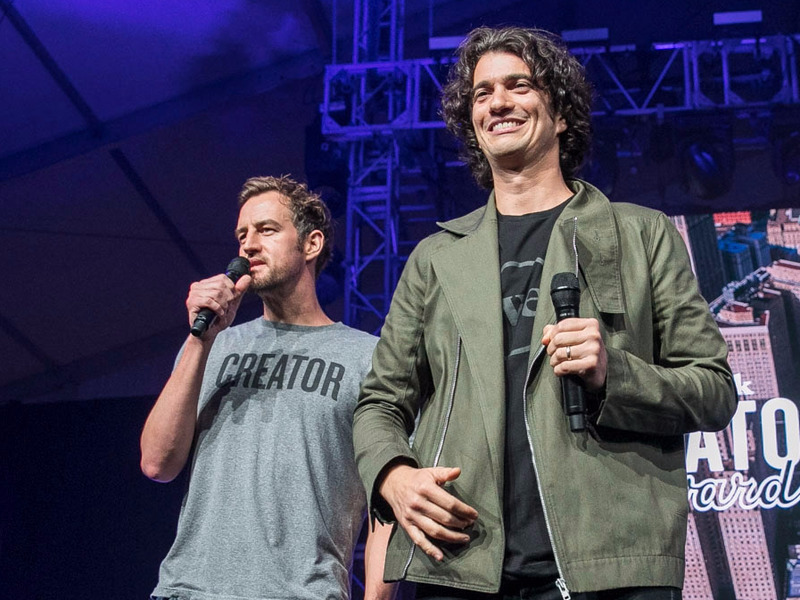 WeWork also revealed its financials for the first half of 2018, showing that revenue doubled to $US764 million. Business Insider understands the company is still in talks to raise a new equity round at a $US35 billion valuation. Shared office startup WeWork is raising a further $US1 billion in convertible debt from one of its existing investors, SoftBank. The unusual mechanism gives WeWork an immediate cash injection as it continues to funnel money into expanding its shared office business globally. In an interview with Business Insider, WeWork chief financial officer Artie Minson described the financing as “the ability for us to opportunistically add a billion dollars to the balance sheet.” Minson said WeWork had around $US4 billion in cash and commitments. Minson said the loan note would convert from debt to equity under three scenarios: If SoftBank leads a billion-dollar round, the note will convert at the valuation of that round. If the billion-dollar round is led by another investor, the debt converts at a minimum valuation of $US42 billion. And if WeWork goes public, the debt will convert at the IPO price, he said. WeWorkThe lounge area of WeWork on the South Bank. What is unclear at this stage is how the loan note relates to a separate equity round WeWork is thought to be raising at a rumoured $US35 billion valuation, potentially from investors including SoftBank. It’s possible the loan note has come about because the pair can’t agree on a valuation for that round. WeWork also shared some of its financial metrics for the first six months of 2018 with Business Insider. WeWork is a privately held company and so isn’t obliged to disclose its financials, but has shared some numbers with the media. Revenue increased to $US764 million, from $US362 million in the first half of 2017. Adjusted negative EBITDA of $US247 million, from a negative EBITDA of $US63 million last year. Occupancy rates up to 84% from 78%. Total WeWork memberships of 268,000. Enterprise accounts for 25% of WeWork’s members. Adjusted EBITDA before growth investments of $US64 million, up from $US24 million in 2017. According to the figures released to Business Insider, WeWork expanded to 12 new cities and five new countries since the beginning of 2018. The office-sharing company made its name renting offices to small startups, but the numbers show a big chunk of its revenue comes from larger, blue-chip firms. WeWork said a quarter of its members were in that enterprise segment. WeWork also included in its figures a non-standard metric it calls “community-adjusted EBITDA,” which has drawn some scepticism from pundits. This figure is essentially intended to show that WeWork would be profitable if you excluded all the costs it requires to create those profits. WeWork reported community-adjusted EBITDA of $US202 million, up from $US95 million in 2017. WeWork attributed the jump in adjusted EBITDA – the closest indication of WeWork’s losses – to its spend on sales and marketing and expansion into new markets.